Have you ever wondered why Reno in Nevada is called the Biggest Little City In the World? Well you have to explore its happening and eventful lifestyle to find the answer to that. The city offers a plethora of sports and entertainment-related activities that can be enjoyed in all the major venues and theatres if Reno. However, none can beat the value and service of Reno Events Center. This magnificent structure is considered as one of the premier attraction of the city of Reno as it personifies the liveliness and vibrancy of the city. It was in 2005, not very long ago, when the citizens of Reno witnessed the inauguration of small but lavish multi-purpose facility named the Reno Events Center. This long-awaited Micro-sized convention center fulfilled the needs of many by accommodating different kind of events like games, rodeos and concerts. The venue was constructed in Downtown Reno which is non-arguably the most happening part of the city. The well-facilitated venue at 400 N. Center Street was welcomed by the residents of the city and the visitors termed it a welcome addition in the bustling life Downtown Reno. Fast forward to present time and we have the Reno Events Center shining as the brightest gem in Reno"s crown. This is because of its world-class facilities and a good mix of events. The Reno Events Center is considered among the best events centers of USA. Because of its location in a busy street center, the venue can be easily accessed from different parts of the city. While you don"t need to drive much too reach the Reno Center, the CitiFare offers convenient bus routes to and from this place in order to facilitate patrons who cannot come on their own. These drop you at the southwest of the front entrance of Center at the Downtown CitiFare transportation station. Once in and you will be bewildered by the magnificence of this place. If its structure and architect does not attract you much, then the atmosphere inside definitely will as the place holds such exciting events that are bound to have good time here. The Reno Events Center is a huge facility that can hold a crowd of 7,000 and more depending on the nature of event. The venue is designed in such a way that it can accommodate sports, music concerts, live shows and other types of live entertainment. It has been holding various basketball games and has been a home to Reno Bighorns of the NBA Development League from November 2008. This newly-formed team is a craze in Reno and Reno Arts Center is a perfect place to cheer up this team. The venue also hosts electrifying boxing matches and other sports as well. If you are not that crazy about basketball as that of your mate, you can check Reno Events Center for the sake of entertainment. And yes, this place has a lot of it. From rocking music concerts to entertaining comedy shows, you can catch it all here live and excusive. Till yet, the venue has played host to the likes of Destiny's Child, Santana, Van Halen, Kanye West, Lupe Fiasco and Stevie Nicks. The Brooks and Dunn, Rush and Steve Miller Band have also performed here. If we have to comment about technical features of Reno Events Center, then it comes as par other modern day wonders of the region. This state-of-the-art facility is equipped with every amenity that is needed in a good live venue. Be it the 40' by 60' stage or Backstage dressing rooms for live shows, Reno Center ensures hassle-free performance for the pop and rock stars who entertain their fans here. The fans or the supporters are also pampered with great care. With Wireless Internet and LAN service provided in the venue, you can enjoy a game or concert here while staying in touch with important tasks. Second-floor suites can be accessed by utility elevator and escalator while the snack bars in the first-floor are good enough to satisfy your appetite. Moreover, ticket windows and entrance can be accessed by wheelchair. The perfect sound and lighting system and convenient parking also adds to a good visitor"s experience. With an overall Size of 118,000 sq. ft. with 56,000 sq. ft. of floor space, the Reno Events Center provides a perfect atmosphere for intimate concerts and stand-up acts. This is one of the most versatile venues where you can enjoy thrilling basketball games, laugh with headlining comics and sing and dance with biggest music sensations. 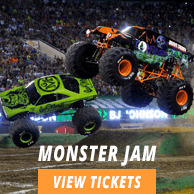 So the next time you want to have real fun, simply go to Reno Events Center and enjoy! The average Reno Events Center Tickets price will cost you between $36 and $307, if you are looking for the cheapest seats then catch the event being held at the Reno Events Center, Reno on 20/04/2019. The average ticket will cost you the highest on 19/10/2019 at the Reno Events Center, Reno. Minimum get in price is for Reno Events Center Tickets is $30 for the event being held at the Reno Events Center, Reno on 20/04/2019 , there are some venues that have a much higher get in price, for instance the cheapest seats at the Reno Events Center, Reno on 19/10/2019 will set you back $118. Can you please tell me about seats numbers at reno events center? Do you have journey reno convention center tickets? Do you have tickets for inside reno events center? I need a few reno events center tickets, how can i choose the delivery mode? Are there any Reno Even Center tickets available here? We have the Reno Events Center tickets, you can order them whenever you like. And to choose the mode of delivery, there is a separate box for tickets delivery, you can choose the method from the list or check the "Add special delivery instructions to my order" option to leave special instructions. Seat numbers are not allowed us to have by the ticket brokers. However, you can choose the rows and sections for Reno Events Center Tickets yourself. Yes, there are heaps of Reno Events Center tickets available at Ticket Luck, so, do not panic, and buy them now! Take a look at our Reno Events Center section for the available tickets. Reno Events Center Tickets are right here so book them now.